Trimbach, a Reverse Wine Snob Favorite! Jon Thorsen is one busy guy. Besides a day job and a family, he also finds time to write the popular and influential wine blog, The Reverse Wine Snob. How big is his site, full of reviews of wines that top out at $20? Well, Vine Pair recently ranked Jon's online influence as eclipsing that of Robert Parker and on the heels of Jancis Robinson. Oh, he's also writing a book. And riding Segways in Cote Rotie. Find out more about Jon in my latest SpeakEasy interview. When you were choosing a title for the blog, how did you settle on “The Reverse Wine Snob”? Did it come to you in a flash of inspiration or was it an idea you had turning over in your head for a while? The whole idea for the site was definitely a flash of inspiration although there's a rather funny story on the name itself. Have you ever had what you thought was a great idea late at night when you're tired, only to wake up the next morning and wonder what the heck you were thinking? That's kind of what happened here as I was thinking about the concept of being the inverse of a wine snob. "The Inverse Wine Snob, that's it!" I thought and went to bed. Upon waking in the morning I quickly realized that was rather stupid...it's reverse snobbery not inverse snobbery and quickly changed it! I had to do a double-take when I saw a photo of you riding a Segway through the vineyards of France? What what that experience like? And what’s it like to ride a Segway?!? Had you done it before? Any new wine discoveries to report? 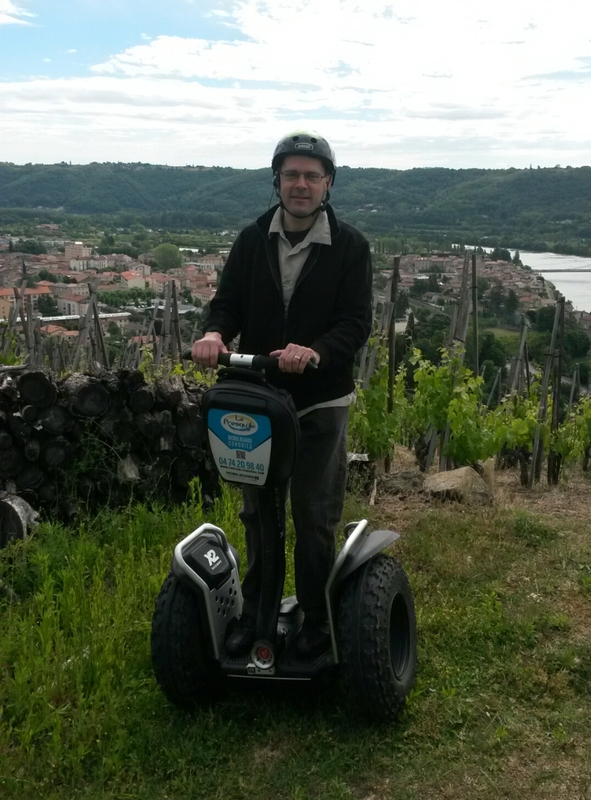 My first and only time on a Segway and it was through the vineyards of Cote Rotie, Condrieu and Chateau-Grillet in the Northern Rhone Valley. What an amazing experience. I was a little worried that they were trying to get rid of the guy who thumbs his nose at expensive wines when I heard that had me doing this my very first morning in France since I not only had lots of jet lag but we were going to be wine tasting along the way. Those terraced vineyards can be pretty steep...I'm sure accidents happen all the time! Even though a lot of the wine there is above my normal 20 dollar limit, it's still an amazing area for any wine lover to visit and I highly recommend it. The Segway was actually the perfect way to get up those steep hills with very little effort and was surprisingly intuitive to ride. As far as wine discoveries go, I was amazed at how much wine is made there that doesn't make it to the U.S. -- much of it pretty reasonably priced too. Besides just not having enough supply, the number one thing I heard was that the U.S. was just too hard to get into with our 3 tier system, that's it's just not worth their time. (And these are wines from one of the most renowned growing areas!) It's something that really needs to change in my mind and it'll be one of the things I address in my upcoming book. I’m not much of a math guy, so I’m curious how you came up with your rating system. Was it something that you agonized over before you settled on your current format? Did you take into account what was already out there, like the 100pt scale, stars, etc.? I didn't agonize over it too much -- I knew that basically I wanted something that factored in both taste and cost and my day job is in marketing analytics, so it's really just the way I think. The hardest part was keeping it relatively simple because my natural tendency would be too come up with a complicated statistical formula, kind of like the QB rating in football that no one understands, and I really wanted to avoid that. And even though it is a mathematical formula, at its core it's still subjective -- how much value one person puts on the price of bottle might be different than someone else. This is why I always show both scores, taste and cost, so if they are other geeky people out there like me (scary!) they can use their own formula to get their final rating. I personally don't get the 100 pt scale at all -- I mean why are there 100 points when 80-90% of wine scored gets put in a narrow 10 point range? And why is there no distinction made between a $12 wine that scores 90 points and a $112 one? Of your recent Top 10 red and white wines, can you give me one of each that people really need to put on their radar and in their glass? I'll resist just giving you my top ranked pick for each and say for red, the one that intrigues me the most right now is the Hermanos Malbec Tannat. Tannat is a grape that I hope we see a lot more of going forward (Uruguay is doing good things with it for example) and I really dig it. It can be a very big, tannic wine so blending it with Malbec really makes a great introduction. In addition, a lot of Malbec has started to get rather boring -- I think the quality has decreased in recent years but this one with 30% Tannat really shines. For whites, I have to go with an old favorite -- the Trimbach Riesling. If you have not yet gotten into wine from Alsace and in particular their dry style of Riesling, then you've got yourself a gift just waiting to be opened. I've been consistently impressed with the wines coming out of this area, many of which offer amazing value. Heck, even their Pinot Grigio (Pinot Gris) tastes amazingly good! You’ve featured a South African Chenin Blanc with a scratch-and-sniff label as well as the Rockus Bockus, which has a pretty wild label. You see so many wines under $20, is label design something that gets your attention when perusing the shelves? What information or design on a label do you find most compelling/useful? In today's market, it really does make a big difference. There are a lot of average wine out there with great labels that end up selling a lot, but personally I'm not interested in those. However, working in marketing, I just love it when you combine a great wine with a great label. This is actually one of the things I talked a lot about with producers in the Rhone Valley when I was there. A lot of French wines have really boring, almost indistinguishable labels -- with great wine inside. It's a problem they realize very well and it is slowly changing as the next generation comes of age and starts to get involved in the family business. One of the things I look for on a label is real-world food pairings on the back. I understand a lot of wineries are trying to be aspirational so they come up with all kinds of exotic foods that go with their wines, but really all they are doing is turning people off and shrinking their potential market. I mean really, the average price of a bottle of wine sold in the U.S. is something like $6-$7. And most of that wine is consumed very quickly, not cellared. If you want to compete in that market, you need to offer food pairings that speak to the people buying them. Congratulations on your upcoming book. What surprises can regular blog readers expect to find within the pages? Thank you, the working title of the book is "Thumbing Your Nose At Bottles Over $20: The Reverse Wine Snob's Guide to Buying Cheap, Quality Wine" and will be published on Skyhorse Publishing in early 2015. The book really gives me an opportunity to expand and reflect on many of the things I've written at the site. The approach I've taken on ReverseWineSnob.com is to primarily focus on reviews, but in the context of those reviews, give small bites of additional information. My hope is that people who read the site everyday end up learning a lot over time and all in the context of drinking and enjoying wine, which is exactly the way I've learned. The book lets me sit back and organize all of that additional info together and go more in depth and it's been a lot of fun to write so far. There will still be lots of specific wine picks but also, for example, a big expansion and discussion of my Ten Tenets of Reverse Wine Snobbery.